You guys, we DID IT! We met the goal for little Iris, and it has been MATCHED! Seriously, she has over TEN THOUSAND DOLLARS in her adoption fund. $10,000. See for yourself: http://reecesrainbow.org/52215/iris I bet you this sweet girl has no idea how many fans she had, how many people are rooting her on, how many people have come together to help her realize her dream, a family of her own! Please share Iris and celebrate with us today! Can’t wait to see what beautiful story God weaves together for this sweet girl! Amazing! 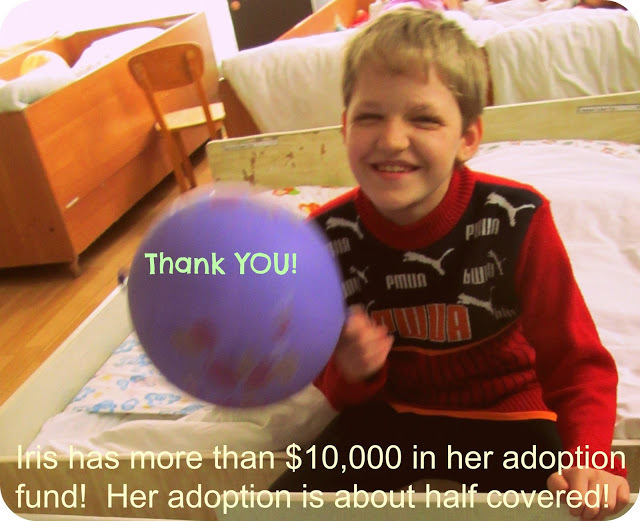 And with the adoption tax credit she is fully funded! Praying that a family will step forward for this sweet girl! Next post: "Let’s do this together"